Light up your spring landscape! Longer days and warmer weather is melting away the last memories of cold winter. The grass is getting greener, leaves are peeking out of tree branches, and flowers are starting to bloom. With all this life popping back up this spring, is your home ready to showcase it? Here are the top areas in your landscape that can be highlighted in the evening and what types of lights to use to showcase them. • Make your trees and shrubs pop with up-lighting. Up-lights highlight the best details in your trees and shrubs make the beautiful greenery and detailed branches stand out. Strategically placed accent lights provide for the ideal up-lighting to trees and shrubs. • Outline your garden paths, sidewalks and other walkways with hidden well lights or beautiful landscape lights. With either option, you and your family can make the most out of the spring weather at night from the comfort of your own landscape. • Improve deck and patio space to make it functional during cool spring nights with the addition of post lights and step lights. These easy additions will allow you and your family to enjoy the lush landscape before you without the worry of tripping over patio furniture in the dark. • Enhance outdoor kitchen space and entryway overhangs with hanging lights and chandeliers. These additions provide functionality for cook prep and easy visuals on where to walk and step throughout your outdoor space. • If your outdoor landscape contains any water features, this element should be a top priority to highlight in your yard when the sun goes down. Adding landscape lighting to an outdoor water feature not only makes it glow and create a relaxing vibe in the evening hours, but it is also one of the best landscape features to emphasize! While colorful lights may seem like a fun addition to your outdoor landscape, use them in moderation. String lantern lights make for a cute Hawaiian backyard theme but going overboard with colored lightbulbs and a large array of colored string lights could quickly turn your backyard into a Christmas explosion. 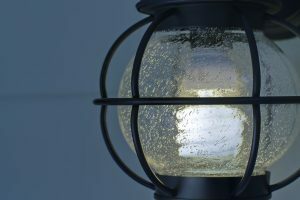 With these easy outdoor landscape light additions, you can make the most out of the warmer weather and good time spent with family this spring. For more help finding the best landscape lighting feature for your yard or garden, stop in to your local Hortons and a lighting expert will be happy to assist you.